Now that you've installed loads of free and open-source applications and utilities, how do you make sure you're keeping up to date with lastest versions? Of course some applications and utiltiies can be configured to automatically check for updates but lots don't. Fortunately, there are a few helpful tools out there. The very useful, free software for Windows download site File Hippo has released a handy little utility called Update Checker. This scans your installed applications and then reports which ones are out of date, along with appropriate download links to get the latest versions. It even lists available beta versions separately. The application doesn't need installing so can be kept on a USB drive portable if you want and you can even customize where it looks for installed applications. App Update is a free Mac OS X Dashboard Widget that checks for updates to your installed applications. It supports Apple's Software Directory, MacUpdate and Version Tracker and will present you with a list of all the updates found, with appropriate download links. It's also pretty customizable, right down to the level of each application it finds. You can set update sources, application search paths and even schedule automatic checking. 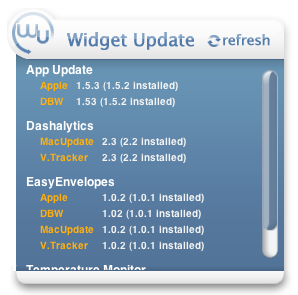 Widget Update is a free Mac OS X Dashboard widget that checks for updates to your installed Widgets. Like it's sister, App Update above, it supports Apple's Software Directory, MacUpdate and Version Tracker and will present you with a list of all the updates found, with appropriate download links. It also supports DashboardWidgets for updates as well. Again, it's also pretty customizable, right down to the level of each Widget it finds. You can set update sources, search paths and even schedule automatic checking. Customize the new releases feed based on specific category. Track the Dashboard Widgets category to view all new widgets that get releases. Auto-hide drawer features with alert when new items are in the list. Obviously it only works with MacUpdate as a checking source but I couldn't get it to work for me.